A unique, no holds barred look at the life and faith of David Tait. Told in story, verse and in testimony of ‘David’s Musings’. An honest look at both the upside and cost of seeking a deeper relationship with God. A journey of discovery through God’s Word, where He reveals His past, present and future plans for both individuals and His Church. On Mount Sinai, God the Father gave Moses detailed design specifications for His first church, Moses Tabernacle. This was accompanied by principles for Godly living as set out in the ‘Feasts of the Lord.’ These patterns were again confirmed 1500 years later in the New Testament teachings of Jesus, who died as the final Passover Lamb. The modern church was birthed in Holy Spirit power on the Day of Pentecost. Now the final stage of God’s eternal plan is about to be fulfilled by the ‘Tabernacle (or Apostolic) Church’, before Jesus returns as the Fathers representative to rule and reign upon the earth. One man’s vision for the Church and the Christian of the future. Firmly based upon scripture, this vision in prose, allegory and poetry will challenge you to seek out God’s plan for you as an individual and for the Tabernacle (Apostolic) Church Movement in these exciting times. Truly inspirational, for those hungry for more of God. "Reach for a light bulb and God provides the ladder. David Tait has written an exciting and challenging book of ‘three halves’ revealing God’s desires for both His followers and His Church in the 21st Century. Firmly based upon Scripture, its unique, down to earth style will appeal to a wide range of readers from the ordinary Christian to the Biblical student. David built Kaydees Gardens to become the largest mail order garden company in New Zealand before selling it to devote his time fully to the Lord. The ‘Walking With Jesus’ course promoted through Kaydees catalogues has helped many thousands of New Zealanders to better understand and further their walk with Jesus. 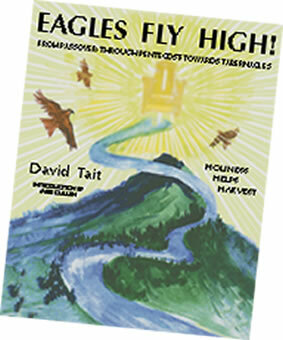 In David’s unique terms, ‘Eagles Fly High!’ is a "book of three halves." The ‘first half’ of the book is a selection of ‘David’s Musings’ in both poetry and prose; some thoughtful, others wistful or humorous – an entertaining insight into the man behind the words! The ‘middle half’ deals with God’s Word, revealing His master plan for both and Church. God the Father gave Moses detailed design specifications for the first church, Moses Tabernacle, on Mount Sinai, accompanied by principles of Godly living as set out in the ‘Feasts of the Lord.’ These patterns were confirmed 1500 years later in the New Testament teachings of Jesus, with the modern Church being birthed in Holy Spirit power on the Day of Pentecost, now finally to be fulfilled by the ‘Tabernacle (Apostolic) Church’ before Jesus returns as the Father’s representative to rule and reign on Earth. The ‘third half’ of the book reveals a challenging, God-given vision of the future, both of Christian living and Church maturity. A necessary read for all who desire a deeper understanding of God’s purpose for their life, as well as Church leaders seeking an understanding of God’s direction for their Church in these difficult yet exciting times. This is something you cannot afford to miss out on! And yes – it’s free – well almost! I became acquainted with David Tait when he did the Word of Life Bible and Discipleship Training Course in our church in 1991. His wife Kathy had completed the study the previous year. Our association grew into friendship and then in 1994 David and Kathy joined our church (Abundant Life Community Church, Tauranga). Since then they have continued to grow in the grace and knowledge of our Lord Jesus Christ. They have learned to be content, regardless of the state they are in, whether having much or little. David has set out this book as a journey of his discovery of truth. He weaves this truth into practical illustration to help the reader identify with his walk in God. He has a unique ability to write about his relationship with God as seen in his everyday observations of himself and the environment around him. David’s pragmatic approach to life is shown in the way he presents his stories in parable form (and for those who may struggle with the interpretation, he gives the meanings of the key symbols at the end of the story). The central theme of ‘Eagles Fly High!’ is the scripture from Revelation 12:11 – "and they overcame him (Satan) by the blood of the Lamb and the word of their testimony, and they did not love their lives to the death". This is a three-part process leading to full maturity in the believer’s life and can be paralleled with the three Feasts of the Lord – Passover, Pentecost and Tabernacles, as well as the three areas of Moses’ Tabernacle – the Outer Court, the Holy Place and the Most Holy Place. David’s desire is that all Christians understand and progress toward full salvation in Christ as revealed through these Old Testament pictures of New Testament truth. I commend this book to you as a means of helping you to understand the journey in Christ that is before each one of us. May you be enthused and encouraged as you travel along the pathway that David maps out before you. on also for a number of years now. do call at the College, we would love to fellowship with you. manuscript of ‘Eagles Fly High’. It is so valuable to get our teaching notes into print. You have turned out a fantastic job. I trust the second half of this year to be the best to date in your Christian ministry. churches, and every effort is an advance! Part Too ‘The First & Last Word"